The injectable B17 is an extract from the raw apricot seed just like the B17 tablets. I recommend doing the raw apricot seeds with the injectable as it’s a whole food and there are other nutrients in the seed, B15, enzymes etc. The benefit of the injectable form is that you can start out using large doses as it does not go through the digestive system. It goes straight into the vein. You can do 9000 mg a day your first day rather than having to build up to it like you do with the seeds and the tablets. Further, some people just cannot work up to that high of a level. The book World without Cancer and the free video World Without Cancer, both talk about all of this. You can get the video for free by signing up at the top right-hand corner of the banner above or at the bottom of any page. Each injectable ampoule consists of three grams of pure (99.8%) laetrile powder mixed with 3cc of DMSO and 7cc of sterile water. How to administer this can be found under the protocol section of this site. 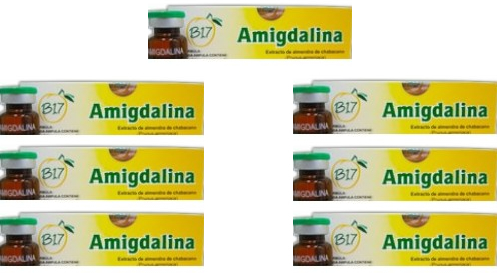 Other than pure amygdalin (laboratory name for laetrile/B17), the injectable is best form of laetrile therapy. It will be necessary for anyone wanting to do the injectables in their home, to consider that they may need professional medical advice/service/training with regard to the installation of a catheter port through which the injection will be administered and also the syringes required for the injections and other items necessary to conduct the procedure in a sterile environment.